“Fascist” is usually used today as a political insult, often thrown about by people with little idea of what fascism actually entails. But in the Italy of the 1920s, it offered a number of answers to desperate people who hoped a melding of state and corporate power could fix their economic woes and either did not consider or ignored the potential abuse of such power. Fascism as practiced by Benito Mussolini was a populist movement, relying on a number of external trappings including adoration of the leader, Il Duce, the only one who could fix things and who was literally “always right.” It looked to the future, promoting new technologies (aircraft, motor vehicles) and reaching out to Italian youth. 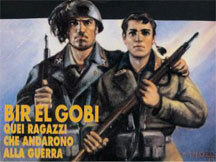 Upon Italy's declaration of war against Britain and France in June 1940, the Gioventu' italiana del Littorio, the Italian fascist party's youth league, registered 25,000 volunteers who formed 24 battalions of 18- to 21-year-old Young Fascists, or Giovani Fascisti (GGFF). The GGFF battalions trained in Liguria, on the Italian northwest coast, until October, when the remaining 19,000 marched down the Po Valley to Padova in the northeast for a final review by Benito Mussolini. When word spread afterwards that their battalions would be disbanded and the youth sent back to school — Army generals apparently feared Mussolini was on the verge of commissioning all the Young Fascists as officers — mutiny spread through the ranks and members of one battalion set Il Duce's reviewing stand on fire. Calm before the fire. Disgruntled GGFF drummers await Mussolini's speech, 10 October 1940. Convinced of this burning desire to fight Italy's enemies, Mussolini agreed to retain three battalions picked from the best volunteers. Training took place for the rest of the year, and on 12 January 1941 the three battalions were enrolled in the fascist Blackshirt militia as the 301st Legion. Once again protests broke out, and once again the government relented, transferring the unit to the Army six days later as the "Gruppo Battaglione GGFF." They wore standard Army-issue uniforms with the GIL emblem and the black fez of World War One Arditi units. Throughout the first half of 1941 they trained intensively, with particular emphasis on physical fitness. The Army intended to attach the unit — now reduced to two battalions, with the third converted to machine gun and heavy weapon companies — to the Italian expeditionary corps assembling for the invasion of the Soviet Union. Mussolini objected that "the Russian front is no place for boys" and asked that they go to Libya instead. The Gruppo landed in Tripoli in late July and spent the next month on garrison duty. On 2 September they became part of RECAM, the Italian motorized reconnaissance group. The GGFF made their mark during Operation Crusader. Tasked to defend the small hill known as Bir el Gubi, they fought off repeated attacks by the 11th Indian Brigade and British 7th Armoured Division during the first week of December, 1941. Despite overwhelming odds, they inflicted massive casualties on the Allies and held their ground despite severe hunger and thirst. Afterwards, they withdrew from the front for rest and re-fitting. The next month, the Royal Army officially decided to convert the GGFF to an armored division in Africa, once enough tanks became available. It would be known as the 136th "Giovani Fascisti" Armored Division and follow the standard table of organization except for having the GGFF battalions as its infantry element instead of a Bersaglieri regiment. The GGFF began the Gazala battle in May 1942 as part of the army reserve, with four infantry battalions — the two original GGFF battalions, plus 9th Independent Infantry Battalion and the 3rd Battalion of the San Marco Marine Regiment (which was later detached to join the Hecker amphibious group). During the course of the battle, the remaining three battalions went forward to assist the 102nd "Trento" Division's penetration of the Allied minefield zone. The Oasis of Siwa, where the Young Fascists sat out the Battles of Alamein. In July 1942, German Ju-52 transport planes transported one battalion to seize the strategic Oasis of Siwa, the largest air-landing assault conducted by the Axis in Africa. Siwa lies about 140 miles south of Mersa Matruh and 350 miles west of Cairo. It boasts three lakes and numerous springs, supporting lush vegetation over a zone about 50 miles long by 12 miles wide. Dates and olives are grown there, and in the 1940's about 9,000 people lived there. The rest of the division soon arrived as well, except for two companies from the 4th Anti-Tank Battalion. A German "Oasis Company" also showed up to help garrison the large, fertile area. The oasis had been a staging area for raids by the Allied Long Range Desert Group into Libya, and now the Axis saw an opportunity to return the favor. Italian planners looked longingly at the tracks leading to the Nile. Field Marshal Erwin Rommel visited on 22 September and reviewed the unit. Officers showed him their maps and scouting reports of the deep desert, and several Egyptian clan chiefs gave their opinions that no substantial Allied forces stood between Siwa and the Nile. The Young Fascist Division, the officers claimed, could unhinge the Allied positions on the coast from Siwa if only they had the fuel. Young Fascist anti-tank gunners exercise with a 47/32 gun outside Tripoli. While they waited, the Italians set up an Egyptian government-in-exile, complete with postage stamps, and flew the Egyptian flag alongside the Italian tricolor. At Siwa, the Young Fascists continued to train and fight off an outbreak of malaria that soon had 800 men in the new hospital they built at the oasis. Others fought boredom, and 825 soldiers filed formal requests to transfer to units fighting to the north. Meanwhile, reinforcements continued to arrive to build the unit into a full armored division. The division's artillery component came from two battalions of the Guardia alla Frontiera, the Italian border guards, plus two newly-raised battalions of truck-mounted 65mm light mountain howitzers. But finding enough tanks and Semoventi assault guns for the new division proved impossible. The two armored divisions at the front (132nd "Ariete" and 133rd "Littorio") never reached their full complements during the Alamein campaign. The 131st "Centauro," arriving in Tripoli in mid-November, did have all of its tanks but lost some of its Semoventi during the crossing. Production of the standard Italian medium tank, the M13/40, did not top 800 units during the course of the war. Fiat-Ansaldo could not provide adequate replacements for combat losses, let alone enough to equip new battalions. Only through great effort could all three existing armored divisions enter the combat zone at once, and two of them were grossly under-strength in tanks. When the Axis position at Alamein collapsed in early November 1942, the GGFF mounted its approximately 3,000 men on 290 trucks and headed directly west across the Libyan desert, suffering two air attacks but successfully avoiding Allied tank columns. The German company veered off toward the coast and eventually surrendered to the Allies, but a small battalion of Libyan camelry that had been patrolling the Quattara Depression joined the column. When the GGFF joined the rest of Rommel's army near Mersa el Brega, they were in the best condition of any Axis units. The GGFF had actually received reinforcements in the form of a new III Battalion, and quickly drew rearguard duty. The Young Fascists crossed into Tunisia in January 1943, and fought along the Mareth Line, at Enfidaville and in the final defense of Tunis and Bizerte, where the GGFF was the last Axis unit to surrender. Separating men and boys. Italian propaganda celebrates the GGFF's stand. Though a very successful combat organization, the unit's record also shows the Royal Army's deep failings. The troopers of the GGFF were well-trained and dedicated, educated men in their late teens and early 20s who would have been prime candidates to fill the Army's desperate need for junior officers and NCO's. Concentrated in two or three battalions as common soldiers, they fought very well while meanwhile regular units crumbled for lack of such men to lead them. Italy was not lacking in courageous soldiers; what it lacked was intelligent employment of its human resources. 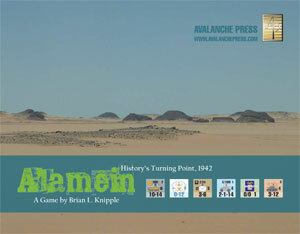 The Young Fascists do not appear in Alamein, as Siwa Oasis is well off the southern edge of the map. As a variation, allow the Axis player to summon the division to the battlefield on any turn after 22 September. The Axis player rolls one die; remove the resulting number of steps from the division's units. All units enter at hex 0124. We've included the tank battalions promised but never delivered; as the Allied command does not seem to have been aware of the extent of the Italian deployment at Siwa, the Axis player rolls two dice for each when summoning the 136th. On a result of 11, the tank battalion enters reduced in strength by one step. On a result of 12, it enters at full strength. On any other result, it does not enter play at all. Once summoned, the Axis player must expend supply points to prepare the 136th for the next four days. Its artillery units enter with only one ration of ammunition (instead of the usual two). You may download the new counters for the 136th Division here.